Following up with a tradition of excellence, Shure Inc. introduces us to their latest in ear monitor (IEM), the SE110. Priced fairly reasonably, the SE110 aims to pick up where the aging and now discontinued E2c left off. It also introduces a new low-end product for Shure’s general consumer “SE” series since the “E” designation is now being used for professional IEM models. The Shure SE110 utilizes a single dynamic driver design that is capable of a frequency range from 22Hz – 17.5kHz. This isn’t the most impressive frequency range for an audio enthusiast, but it is very sufficient for many people. All of this technical wonder is contained within a clean and good looking housing that is available in either black or white. Also included with the SE110’s is Shure’s classic package of many different tips to fit the plethora of ears that these IEM’s might satisfy. Shure provides a set of rubber and foam tips in sizes small, medium, and large with their package to help obtain a greater seal while maintaining a good level of comfort. A helpful cleaning tool is also included in the package to keep out any ear wax that may have entered the headset. In order to protect and not lose these accessories, Shure provides a soft and thin profiled case to carry your headphones and extra sleeves around. The case is nothing special, but it serves its purpose and even has a carabiner to attach onto a backpack. With the most important aspect of any headphone being sound, Shure’s SE110’s perform quite well at their price level. The dynamic driver provides plenty of bass impact for all genres of music as well as a warm sounding midrange. Seeing as how this is the low-end model of Shure’s SE lineup, the SE110 does lack in bass extension and the definition of its highs. Either way, it’s certainly an improvement over the last generation’s tinny sounding E2c earphones. 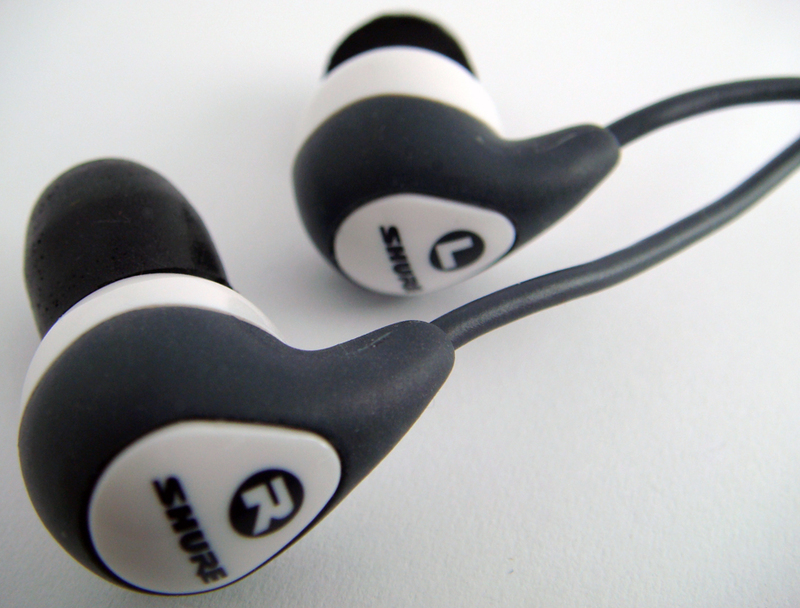 The SE110’s main strong-point is their mid-range. The mids on the SE110 are defined well and are certainly not lacking in their fullness. While they aren’t as articulate and separated as other IEM’s it doesn’t feel jumbled together either. 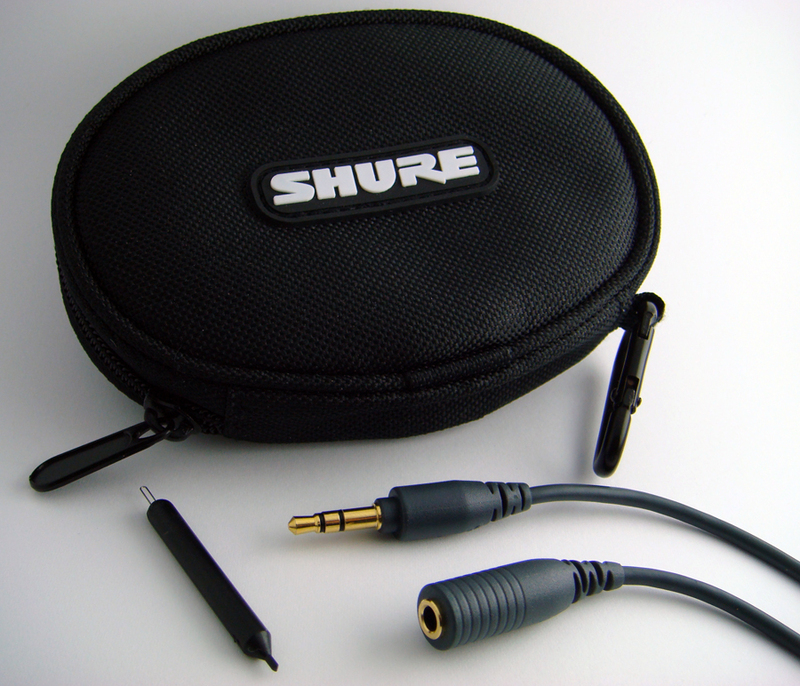 Shure puts a warm emphasis on the mid-range giving them a more forward feeling and sound. While the mid-range comes across well with the SE110’s the bass and high-end are somewhat lacking. One thing the SE110 offers is a strong bass impact (the oomph!). In some cases it might feel overwhelming. While the bass impact is strong, the extension of the bass into the lower frequencies suffers. In many of the selected test tracks, other IEM’s were able to bring out the details of the lower bass frequencies that the SE110’s had difficulty displaying. The high-end on the SE110 also lacking. The emphasis on the high-end quality doesn’t seem to be there just yet. Cymbals felt empty with no punch behind them and certain highs in different pieces couldn’t be brought out at all. Despite the SE110’s shortcomings, at this price-point of just $99 (MSRP is $119) and product line placement, it carries a pretty good value. (Available in stores and online now!) The majority of users purchasing the SE110 will probably be taking a good first step into the high end audio world and the SE110’s won’t be disappointing. 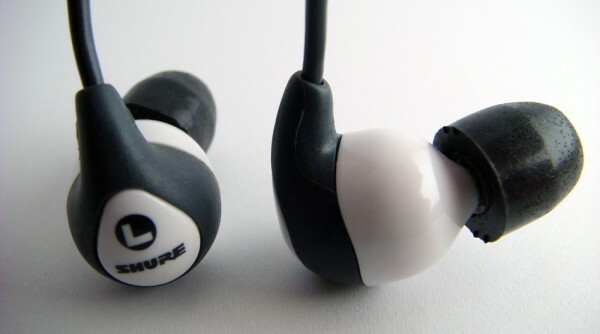 If you wish for something a step better you may also be interested in the Shure SE210 Earphones. In the future, however, it will be worth upgrading to higher-end IEM’s whether they be from Shure or other manufacturers such as Westone, Ultimate Ears, and Etymotic. I listen mainly to acoustic music, folk, guitars, single voice etc., but a smattering of all sorts really. These are very good at mid range, and I am extremely impressed. The reviewer did not say too much about blocking outside noise, but these are good, even on a plane.